Protesting Cartography: Places the United States has Bombed is a series of protest drawings of US military interventions. Utilizing surveillance imagery, military websites such as the US Department of Defense battle plans, aerial photography, mass media, and maps, each drawing is based on a rendering of a place, almost always viewed from the air, which has been targeted by US bombers. I choose to make these drawings by hand rather than to employ photographic or other mechanical means in the hope that people will take their time with them This project is an attempt to provide: a comprehensive and more humane acknowledgement of war; a revelation and analysis of our own complicity and passive acceptance of things as they are; different and multiple ways to access, interpret, and act on the magnitude of war and its aftermath; the truth; an uncovering of covert operations; and a remembrance of the dead for the living. ELIN O’HARA SLAVICK IS A PROFESSOR OF ART AT THE UNIVERSITY OF NORTH CAROLINA AT CHAPEL HILL, USA, WHERE SHE TEACHES STUDIO ART PRACTICE AND THEORY (WWW.UNC.EDU/~EOSLAVIC). SLAVICK HAS EXHIBITED HER WORK IN HONG KONG, CANADA, FRANCE, ITALY, SCOTLAND, ENGLAND, CUBA, AND THE NETHERLANDS, AND ACROSS THE UNITED STATES AND HOPES TO SEE THE TRANSFORMATION OF GLOBAL CAPITALISM INTO SOME MORE EQUITABLE AND DEMOCRATIC FORM BEFORE SHE DIES. History is amoral: events occurred. But memory is moral; what we consciously remember is what our conscience remembers. If one no longer has land but has memory of land, then one can make a map. 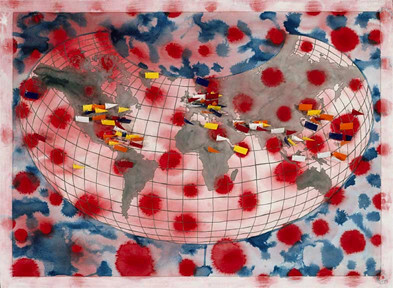 Protesting Cartography: Places the United States has Bombed is an ongoing series of more than fifty drawings begun in 1999. They are first and foremost protest drawings,taking as their subject US military interventions utilizing the geography, politics, history, cartography, art, and the language of war as their source material. Each drawing is based on a rendering of a place, almost always viewed from the air, which has been targeted by US bombers. An important common formal element in the drawings is that each one begins with ink or watercolor dropped onto the wet paper. When it dries this becomes the foundation or “blank page” upon which to tell a violent story. I chose this common ground of abstract swirling or bleeding to depict the manner in which bombs do not stay within their intended borders. Depleted uranium and other chemical agents contaminate the soil, traveling in water and currents of air for decades. Mines and unexploded bombs lay in wait for unsuspecting victims who were not even alive during the war. Bombs penetrate the planet’s surface and lay the groundwork for genocide, cancer, more war, terrorism, widows, orphans, and a vengeful populace on all sides of conflict. All this seems impossible to comprehend, much less change. However, Protesting Cartography attempts to do just that by illuminating US foreign policy, by making it visually accessible and by graphically revealing its part in the dire situation in which we find ourselves today.